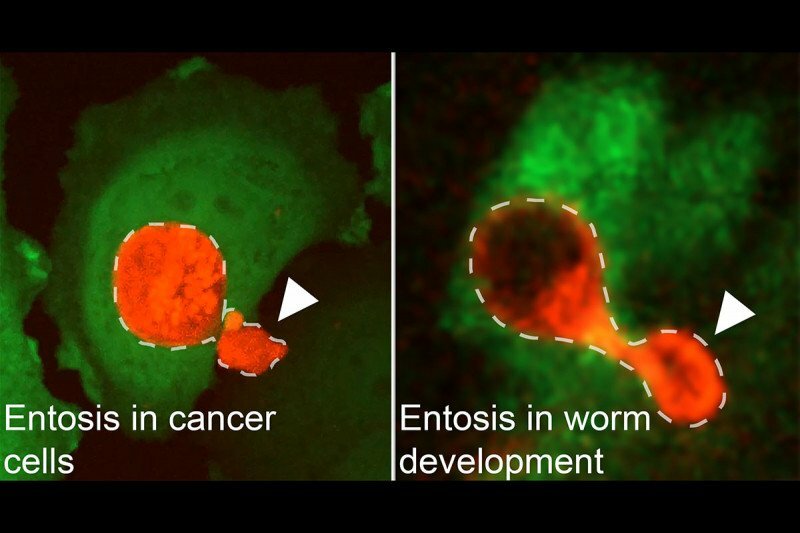 Entosis in breast cancer cells occurs in the same way as in C. elegans worm development. The arrowheads indicate the lobes that will separate from the entotic cells. Researchers have found that a process called entosis plays a role in the development of the C. elegans worm. In biology, how cells die is as important as how they live. Cell death provides a counterbalance to cell division, maintaining the proper number of cells throughout an organism’s lifetime. 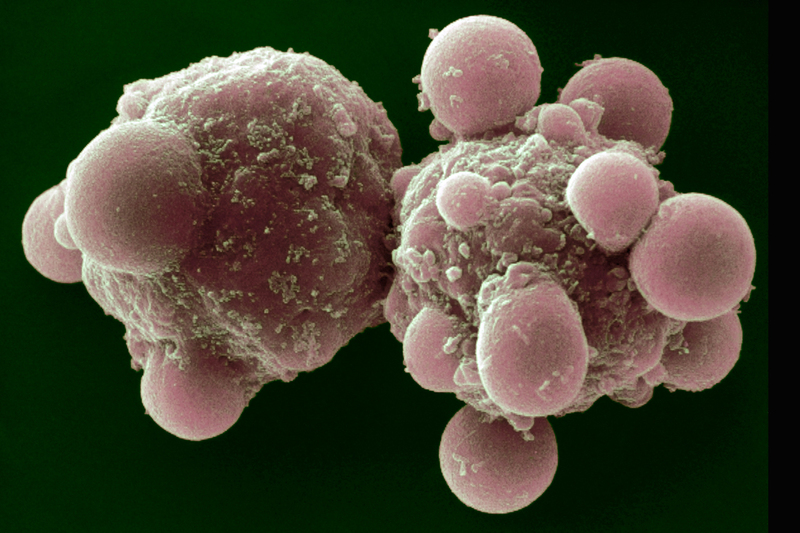 Gaining a better understanding of how cells die is also important for cancer research. It can teach us how the body naturally fends off cancer — by preventing runaway cell growth — as well as point to new ways to target and kill tumor cells. The lab of Sloan Kettering Institute cell biologist Michael Overholtzer explores the mechanisms of different kinds of cell death. More than a decade ago, while studying breast cancer cells, he was the first to observe a type of cell death called entosis, in which one cell engulfs and kills another. Entosis is a process by which one cell engulfs and kills another. In a study published in March 2019 in Cell Reports, Dr. Overholtzer described for the first time the role of entosis in the development of a tiny worm called C. elegans. The discovery is significant because until now very little has been known about the role that entosis plays in natural developmental processes. The most well-studied form of cell death is called apoptosis. Apoptosis is a type of programmed cell death sometimes likened to cellular suicide, in which a cell breaks down in a regulated, systematic fashion. Apoptosis can occur in response to cell damage, but it’s also a normal part of development in embryos. For example, apoptosis in the hands and feet allows individual fingers and toes to form, by killing cells in the spaces in between them. In the March 2019 study, the researchers focused on the development of the gastrointestinal and reproductive tracts of the C. elegans worm, a popular lab model for studying development. Research from a team at Rockefeller University had suggested that forms of cell death other than apoptosis were important in the formation of parts of the worm’s body. Dr. Overholtzer’s team decided to continue this line of inquiry. In particular, the researchers looked at the role of cell death in the formation of the cloaca, the dual-purpose orifice at the hind end of worms, as well as many other organisms, from which excrement is discharged. In males, it is also where sperm are released. It turns out that entosis is vital to ensuring that the genital tract connects to the cloaca. Without it, male worms are sterile. Cell biologist Michael Overholtzer explains apoptosis, a form of programmed cell death that can lead to cancer when it doesn’t function properly. Unlike apoptosis, entosis requires two cells. It might sound more like a murder than a suicide, but cells that undergo death by entosis still have a death wish. They actually burrow themselves into the other cell, where they are broken down and eaten. In the C. elegans embryo, a type of cell called a linker cell pulls the developing genital tract into the cloaca. The linker cell then burrows into another cell, where it is destroyed by entosis. Destruction of the linker cell creates an opening that allows sperm to enter the cloaca. Further research will focus on figuring out whether entosis contributes to other developmental processes, as well as molecular changes in the cell that lead to death by entosis. The researchers also plan to study a piece of the linker cell that is left behind after the cell undergoes entosis, called the lobe. “These pieces stick around for a long time, so we think they may have some purpose,” Dr. Overholtzer concludes. Investigators from the University of Texas at Arlington, the Babraham Institute, the Francis Crick Institute, the University of Massachusetts Medical School, and Weill Cornell Medical College also contributed to this study. This research was funded by National Institutes of Health grants RO1AG047182 and RO1CA154649. It was also supported by the Benjamin Friedman Research Fund; Cancer Research UK; a grant from the Medical Research Council, Biotechnology and Biological Sciences Research Council, and Engineering and Physical Sciences Research Council; and the Francis Crick Institute.